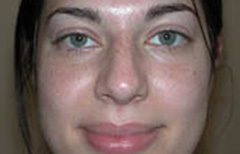 This pleasant 27-year-old female came to see us with her fiancé to discuss rhinoplasty. She had had a fracture of her nose at age 19 that had been treated without surgery. After the accident, she noticed a hump on her nose that she wanted to have removed. In addition, she wanted to make the tip more narrow and less wide. She was planning to get married in six months and wanted to have the surgery performed much in advance of the wedding photographs. She wanted to get rid of the hump on the nose and wanted to create a slightly concave contour to the profile. 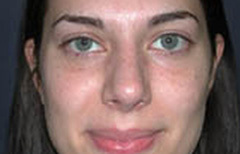 Five months before her wedding, she underwent rhinoplasty through a closed approach. All of the incisions were placed inside the nostril. The profile was contoured with small rasps. The cartilages in the tip were narrowed. The nasal bones were fractured to allow the nose to become more narrow. She was seen six weeks after undergoing the procedure as an outpatient. At six weeks, she was happy with the outcome and even noticed better breathing through both sides of her nose. She was known to have swelling at the tip and this improved over the next several months as expected. At her eight month follow-up, you can see a very nice contour to the profile. The tip is more narrow and balanced with the other parts of her nose and face. She is breathing well through both sides of the nose. She is very happy with the results.